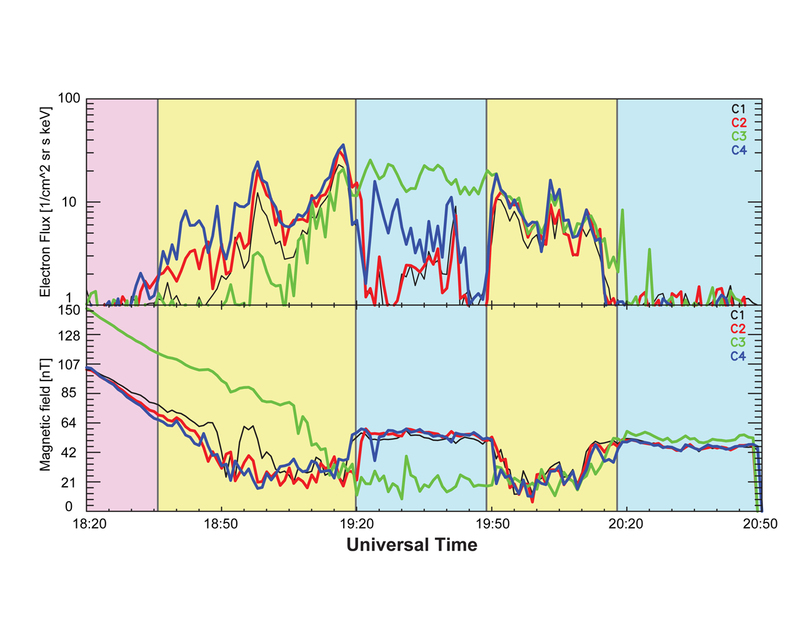 This graph shows data collected by the four spacecraft of ESA's Cluster mission as they fly from the magnetosphere into the northern cusp on 14 February 2003. This event was particularly favourable to study how the cusp's properties vary in space and time because, while the four spacecraft of the Cluster mission entered the northern cusp, their separation was very large, about 5000 km. This allowed the spacecraft to perform simultaneous measurements in regions characterised by substantially different magnetic field intensities. The graph shows the density of high-energy electrons (above) and the intensity of the magnetic field (below) as recorded by the four spacecraft. As they crossed the cusp, the spacecraft repeatedly encountered regions of weaker and stronger magnetic field. This is shown in the different portions of the graph. 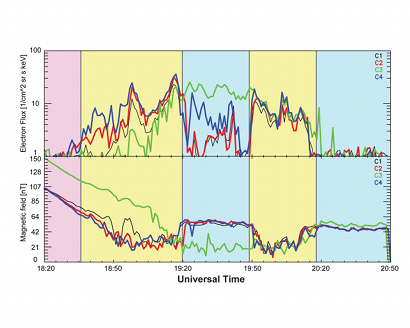 1) First, all four spacecraft were in the magnetosphere (left side of the graph, shown in pink). 2) Then, while one spacecraft (C3, indicated with a green line) was still travelling through the magnetosphere region, where the magnetic field is stronger, the other three (C1, C2 and C4, indicated in black, red and blue, respectively) were passing across the cusp and encountered the so-called diamagnetic cavity, a region characterised by a very weak magnetic field (yellow region toward the left side of the graph). 3) In the meantime, the interplanetary magnetic field changed direction from northward to southward, thus shifting the site where magnetic reconnection events occur from one side of the cusp to the opposite side. This changed the location, size and shape of the diamagnetic cavity. As spacecraft C1, C2 and C4 proceeded, they left the cavity and encountered the magnetosheath, where the magnetic field is stronger again; meanwhile, C3 entered a region of weak magnetic field – the cavity, whose location, size and shape had changed (light-blue region at the centre of the graph). 4) Eventually, all four spacecraft are in the cavity (yellow region toward the right side of the graph) and then again in the magnetosheath (light-blue region at the right side of the graph). During these crossings, the Cluster spacecraft probed the distribution of electrons, protons and oxygen ions, revealing that these particles have substantially higher energy within the cavity, where the magnetic field is low, whereas their energy declines farther away from it.